Create your future. Create Europe. „My Europe” fosters awareness, curiosity, critical thinking, and above all, a chance to participate in shaping a better Europe and assume responsibility for Europe’s future. The initiative has already organized workshops in 20 European countries bringing together students, political figures, business leaders, academics and media representatives. These two-days events offer the students aged between 15 and 20 an unprecedented opportunity to listen, discuss and reflect directly with the respective high-profile experts on a wide range of European issues relevant to their specific context. Over the years we created a strong network of students, politicians, business people and journalists who supported our activities. 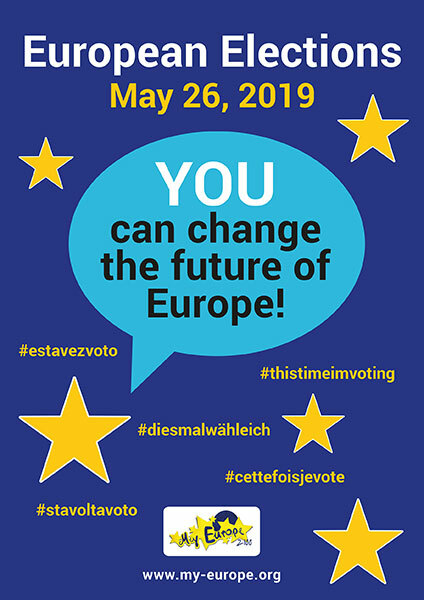 This year, in regard of the upcoming European elections on May 26, 2019, we will create a Social Media campaign with photos and articles. Our goal is to empower young people to create Social Media postings that motivate young voters to participate in the elections. “Give a voice to young Europeans”, this is our principle. Our workshops are a way to give students an opportunity to exchange their ideas and encourage them to more active participation in the shaping of a better Europe. Our new poster „European Elections 2019“ is available!